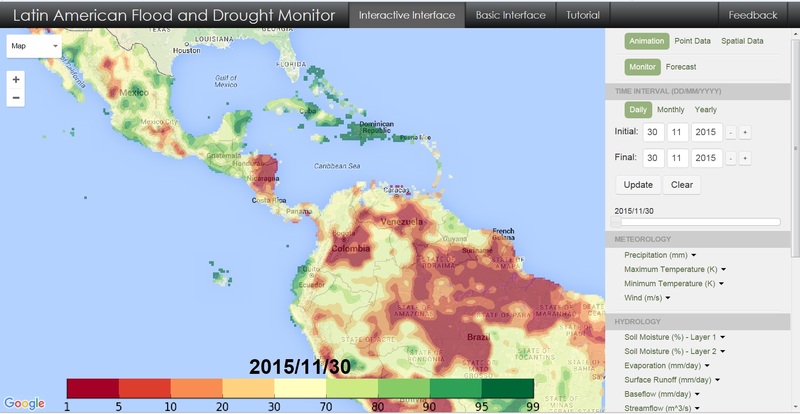 Princeton University in collaboration with ICIWaRM and UNESCO-IHP has developed a drought and flood monitoring and forecasting system for Latin America and the Caribbean. Its use is in understanding the potential of hydrological forecasts for improved decision-making. The system monitors in near real-time the terrestrial water cycle for the region based on remote sensing data and land surface hydrological modeling. The monitoring forms initial conditions for hydrological forecasts at short time scale, aimed at flood forecasting, and seasonal scale aimed at drought and crop yield forecasts. The flood forecasts are driven by precipitation and temperature forecasts from the Global Forecast System (GFS). The drought forecasts are driven by climate forecasts from the North American Multi-Model Ensemble (NMME). Several projects and workshops have been conducted to test and teach the operational capabilities of this system. In November 2014, a capacity building workshop was held at UNESCO Santiago Office in Chile to train professionals from 22 hydrometeorological services in the region of Latin America and the Caribbean. In May 2016, the Chilean Water Authority (DGA) hosted a second workshop in Santiago on “Advancing the Implementation of the Latin American Flood and Drought Monitor at the National Level”. This workshop addressed the scaling limitations of the former product to meet the planning needs at a national level. Case studies in Peru and Chile are currently underway to illustrate the use of the Latin American Flood and Drought Monitor at the national level. For each case study, the spatial resolution will be increased. In addition, local historical and monitoring station data will be incorporated to improve calibration and validation as well as provide real time capabilities. The model will be available as a stand-alone version for local applications for both pilot countries. For additional information, visit the G-WADI or Princeton websites or contact Justin Sheffield or Eric Wood.